I used to think that stress was stress - no different kinds of stress - it was all the same - BAD! 34 Instant Stress-Busters provides relief at work, home, and school. This is the most common of all the kinds of stress. Acute stress is what we feel when we have a deadline to meet, someone rear ends us in the car, our child has occassional problems at school, we loose a contract, the tax return is overdue...And the list can go on. Acute stress can be thrilling in small doses but too much of it is exhausting. Because it is short-term, it usually doesn't have time to cause extensive damage. We all experience times of acute stress - the GOOD NEWS is that it is easy to treat and very manageable! Any of my DIY Stress Relief tips and techniques can have excellent results. Unfortunately, there are those who frequently suffer acute stress.Their lives seem to move from one chaotic episode to the next without a gap of calm in between. They take on too much. They are always in a rush but always late. Things always seem to be going wrong... I hope this is not YOU! They seem to be perpetually caught up in acute stress, with no gaps in-between. People in this situation tend to over-react, be short tempered, irritable, anxious and tense. They are always in a hurry and tend to be abrupt and can seem hostile. Interpersonal relationships are affected and their work or home becomes a very stressful place for them. Another kind of acute episodic stress comes from constant worry. People who are always worrying seem to see the negative in everything, disaster waits around every corner, the whole world is against them and something awful is always about to happen.These "worriers" also tend to be tense and over-aroused but are usually more anxious and depressed than angry and hostile. It is more difficult to treat and relieve this kind of stress. Often lifestyle and personality have become so ingrained that it is difficult for the person to see that they need to make any changes. In fact, sometimes they think that the way they conduct their lives is "normal" and part of who they are.Treating episodic acute stress may need intervention on a number of levels and professional help. So, my advice is to take control of your reactions and stress symptoms before it reaches this stage. Be mindful of how you feel and how you make others feel! Acute stress can sometimes be exciting but chronic stress is not. This is the stress that grinds away at people and wears them down day after day, year after year. Chronic stress damages bodies, minds and emotions.It is the stress caused by poverty, dysfunctional family life, unhappy relationships or feeling trapped. It is the stress felt by people living in war-torn countries.Chronic stress is caused by unrelenting demands and pressures that never seem to end. It is feeling miserable with no visible means of release. Chronic stress comes from feeling hopeless and giving up. Chronic kinds of stress are difficult to alleviate. Some chronic stress comes from childhood trauma that becomes internalised and affects how you feel about yourself for the rest of your life. Cognitive therapy has proved to be very helpful in dealing with negative emotions. Have a look at my cognitive therapy section and see how you can use the techniques yourself. The worst thing about chronic stress is that people get used to it. They get to think that it is normal. Chronic stress can lead to suicide, violence, heart attacks and perhaps, even cancer. Chronic stress wears you out mentally and physically and it takes commitment and hard work and time to recover. This sounds like it is all doom and gloom but recognising the different kinds of stress makes for more effective treatment. Please remember to consult a professional if any symptoms persist or if you feel that you, or a friend, is not coping! Relaxation techniques such as deep breathing, visualization and progressive muscle relaxation can help to activate the body's natural relaxation response. The relaxation response is the opposite of the "fight or flight" response that is stimulated by stressful situations, and is a powerful antidote to all kinds of stress. When practised regularly, these activities reduce your stress levels and boost your feelings of well-being and serenity. What's more, it serves as a protection against the effects of stress by teaching you how to stay calm and collected in the midst of those curved balls. 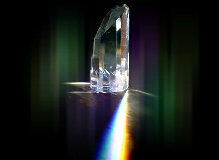 Learn to use crystals and stones as energy transmitters of spiritual information and vibration. Discover the secrets of these powerful and dynamic tools by enrolling in this comprehensive online crystal course today! Learn more here.